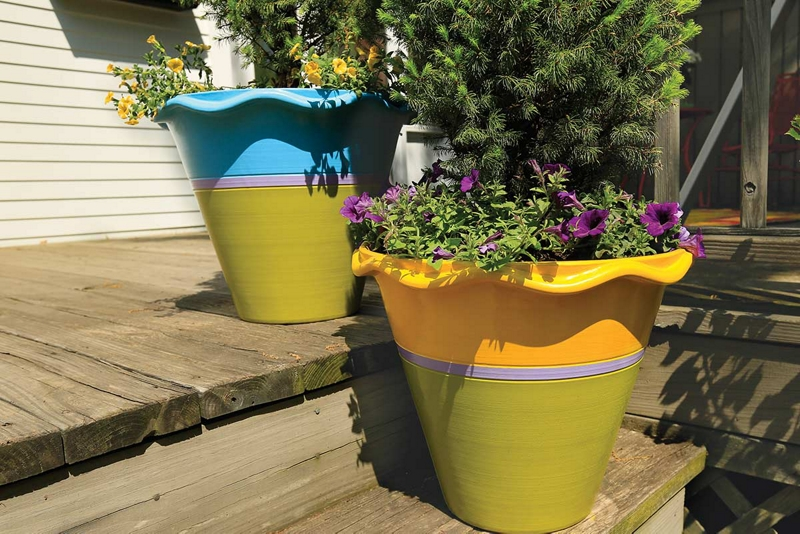 Spice up your patio flora with Krylon® tricolored planters. Clean surfaces of the pots to remove any dirt. Choose your color scheme for each pot. We selected Krylon® ColorMaster™ Paint + Primer in Satin Island Splash, Gloss Sun Yellow and Gloss Gum Drop. Using painter's tape and plastic bags, completely cover the bottom and top half of each planter, leaving a strip of desired width exposed. Applying in a well-ventilated area, hold can of Krylon® ColorMaster™ Paint + Primer - Gloss Gum Drop 6-8 inches from the surface and paint using a sweeping side-to-side motion with slight overlap. Allow paint to dry completely, at least 10 minutes. Uncover top half of the planter; cover the Gum Drop strip. Hold can of Krylon® ColorMaster™ Paint + Primer - Gloss Sun Yellow 6-8 inches from the surface and paint using a sweeping side-to-side motion with slight overlap. Don't forget the inside rim! Allow paint to dry completely, for at least 10 minutes. Cover and tape the top half of the planter, including the Gum Drop strip. Hold can of Krylon® ColorMaster™ Paint + Primer - Satin Island Splash 6-8 inches from the surface and paint using a sweeping side-to-side motion with slight overlap. Allow to dry overnight before planting.